Duck Dynasty’s Jase Robertson accepted the Ice Bucket Challenge to raise awareness of ALS (Amyotrophic Lateral Sclerosis) after being nominated by Tim Tebow and Joba Chamberlain. 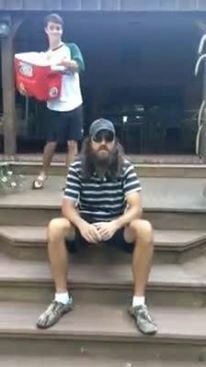 Detroit Tigers pitcher Joba Chamberlain took the ALS Ice Bucket Challenge targeting Jase Robertson, Braves outfielder B.J. Upton, and his own manager, Brad Ausmus. Missy Robertson’s husband has nominated his fellow reality stars John Godwin and Justin Martin.